We have a Emu Hatchery machine for raising a chicks from the eggs.if anybody wanted then contact us.we are making a chicks on rent basis. Specifications: Incubator - Height = 80", Width = 70", Deep = 90"
Hatcher - Height = 80" Width = 44", Deep = 90"
Power 5 KV. Single Phase. 15000 Incubator, 5000Hatcher this is fully automatic and Digital System.Body Make: Hylam Sheet, Heavy alluminum channels Finishing, Hi denisity thermo cole, Digital Temparature Controller, Body turning withouty bottom. 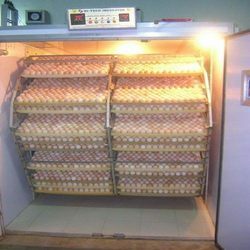 We are eminent manufacturers and suppliers of Poultry- incubators hatcher that has been approved by certified and authentic sources in terms of quality and functional aspect. Our up-to-the-mark Poultry-incubators Hatchers have been examined in the roughest condition in order to cater to the specific needs of the application. We are one for the leading manufacturers of highest quality of Incubators & Hatchers. Digitally controlled and computerized machines, which are presently used in the market. 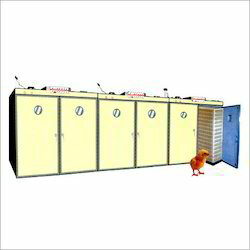 One can avail from us best variety of Commercial Hatcher that is efficient in functioning. "Well begun is half done This well-known saying applies certainly to poultry keeping, since the quality of the day old chick(well begun)tips the scale towards excellent results. The quality of the day old chicks is the foundation of poultry business. Egg grades by electronic weight with sensor technology in deferent grade set by screen touch button.